Nicole Stott rode her Florida dreams, her college degrees from Embry-Riddle Aeronautical University and the University of Central Florida, and her engineering experience at Kennedy Space Center, into space. Now she is retiring as one of the last astronauts who flew on space shuttle Discovery. Stott, who was born in New York and grew up in Clearwater, was a longtime Space Coast resident, as a student and a shuttle engineer assigned to Kennedy Space Center. Then she took the unusual route from launching others into space, to having her former colleagues launch her into space. NASA announced today she is retiring after 27 years with the agency to pursue more dreams: being a full-time artist and advocate for science, technology, engineering and math education. In 2009, Stott flew aboard space shuttle Discovery on the STS-128 mission to the space station for a long-duration mission. As part of her 91 days there, she conducted a nearly seven-hour-long spacewalk and guided the station’s Canadarm2 robotic arm for the first track and capture of a visiting cargo vehicle. She flew again in 2011, as a mission specialist on the STS-133 mission, the 39th and final flight for space shuttle Discovery. During that 13-day flight, the crew delivered the Permanent Multipurpose Module (PMM), completing the U.S. assembly portion of the space station. Christopher Bryan Robert Stott is a space entrepreneur. He is best known for co-founding the regulatory and orbital frequency services company, ManSat, and the commercial spaceline, Excalibur Almaz. 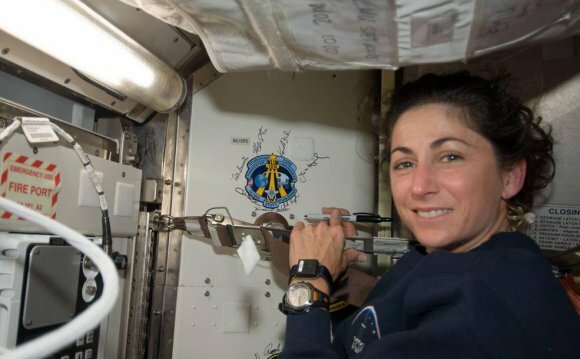 Nicole Marie Passonno Stott is an American engineer and a NASA astronaut. She served as a Flight Engineer on ISS Expedition 20 and Expedition 21 and was a Mission Specialist on STS-128. In 2011, She flew a second time as a Mission Specialist on STS-133. Who were the astronauts on Apollo 11?